We checked into the Holiday Inn Express on Bay Street in the heart of the Historic District in Savannah at 6:00PM on Friday October 3rd ~ just in time to enjoy "October Fest" on the river, just a block from our hotel. 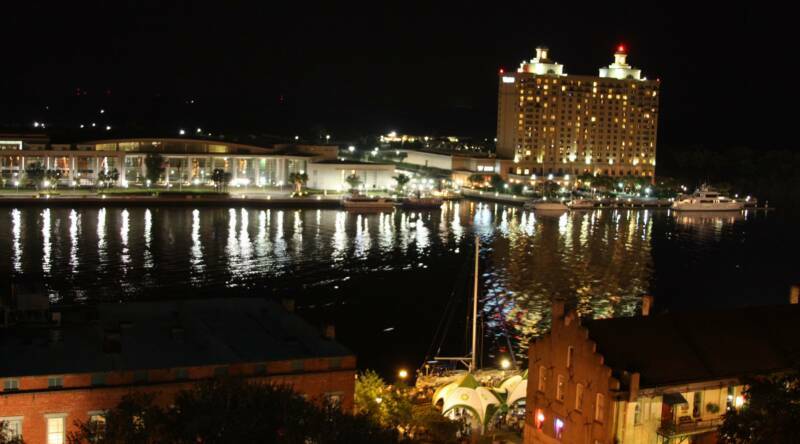 The river front was alive with tourists, crafters, food vendors, live music, and party goers! After browsing in several craft and art shops on the river front we stopped at the Boar's Head for an outstanding dinner. 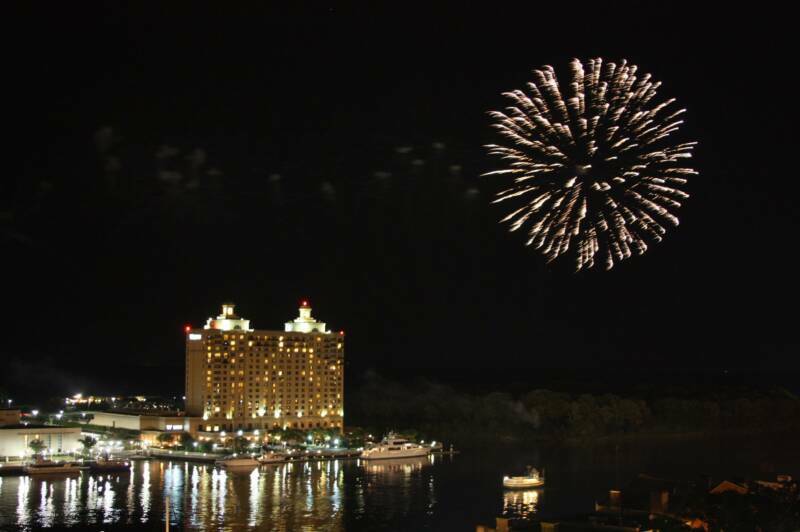 Then back to the hotel and up to the rooftop to watch the fireworks over the river. Saturday we drove down to St. Augustine Beach and after a stop at the Publix for supplies, we checked into the Hampton Inn at 3:30PM ~ 3rd floor, king sized bed, ocean view, Jacuzzi, with balcony! Saturday evening we went to dinner at Amici's Italian restaurant. For the past 5 years it has become a tradition for us to start our first evening in St. Augustine at Amici's ~ a family restaurant that features outstanding Italian cuisine and excellent service. This year our server was an attractive and personable young woman named Julia. She is from Moscow and is currently studying Psychology here in the States at Flagler College. We had a very pleasant dinner followed by some shopping in St. Augustine and then back to the Hampton for a quiet evening. Sunday morning I got up at 5:00AM to watch the sunrise ~ it came up at 6:50! Oh well, I got my picture. Later we took a nature walk on the beach and grounds of the Fort Matanzas National Monument. The beach there is one of my favorites ~ wide, soft sand, and not too many people. We saw lots of birds and some interesting plant life in the dunes. to the Beach Comber a great little beach front restaurant less than a mile from our hotel. On the recommendation of Bobby Reed, we ordered their famous "Minorcan Chowder", a zesty delight that brings in folks from as far away as Orlando just to have a cup of the wonderful stuff! Izzie had a foot long "Swell Dog" and I had 1/4 lb of steamed shrimp & a cup of "Black-Eyed Pea Salad" to go with the Chowder. We finished our Sunday at Salt Water Cowboys, a picturesque restaurant housed in a recreated turn of the century fish camp surrounded by saltwater marshes. They specialize in fresh seafood, delicious ribs, and chicken. There are always a number of friendly cats hanging out around the building looking for handouts. A fun way to end our day. Monday morning we had a hardy breakfast at the Beach Comber ~ Izzie had the 12" pancake with an egg over light & I had the veggie omelet with homefries and whole wheat toast. Next, we headed to The Old City to soak up some history and visit some of the shops in the district. St. Augustine is the oldest continuously occupied city in the United States. It was discovered by Juan Ponce de Leon on April 3rd, 1513 when he landed here in search of the Fountain of Youth. We ended our day at Cafe Atlantico, perhaps the finest restaurant on the island. Chef Paolo did his magic once again and provided us with another memorable evening. He is truly a master chef! Tuesday, after a complimentary Hampton breakfast, we drove down to the St. Augustine Lighthouse. It began operation in 1874 shortly after the Civil War. We climbed the 219 steps to enjoy the view from the top and then toured the grounds and the Lightkeeper's house which serves as a museum today. Next we visited the San Sebastian Winery ~ had a great tour that ended with a wine tasting ~ we had 8 different wines! Finally, we made a stop at Whetstone Chocolates of St. Augustine for some great chocolates and gelato. After a last walk on the beach followed by some wine, cheese, & crackers while relaxing in the jacuzzi, we decided to return to Amici's for our last St. Augustine dinner of the year. We said our goodbyes to our server Julia and headed back to the hotel to pack up for the journey north tomorrow.